When the topic is Irish food, what do you think of first? If you live in the US, the answer is likely Corned Beef. With cabbage, of course. Second? Probably potatoes (who hasn’t heard of the Irish Potato Famine?). Potatoes have been an important food in Ireland since the late 17th century, and historically formed the foundation for many a meal. Equally important historically are cabbage and kale (kale is actually a form of cabbage). These two foods would appear on most tables many times each week. So of course someone eventually decided to combine them — in a dish that became known as Colcannon. 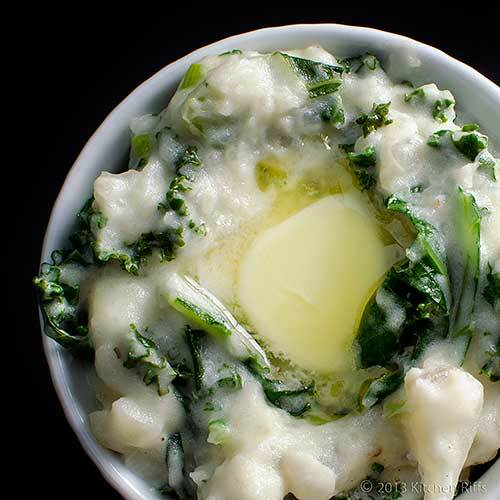 Colcannon mixes mashed potatoes with kale (or cabbage). For extra flavor, many cooks add onions, leeks, or scallions. It’s a hearty dish that’s almost a meal in itself (and at times it no doubt was). Today most of us would probably serve it as a side dish. It pairs well with almost any meat, but particularly shines with ham, sausages, or corned beef. Almost everyone will love this dish! After all, mashed potatoes are a near universal favorite, and the addition of kale adds terrific healthy flavor. Best of all, this is a pretty simple recipe to make. So with St. Patrick’s Day just around the corner (a week from today), maybe it’s time to try Colcannon. Once you taste it, you may contemplate moving to Ireland. I may join you. Although many recipes for Colcannon use cabbage, I think kale tastes (and looks) better. So that’s how I make it. But in the Notes, I include instructions for substituting cabbage if that’s what you prefer. 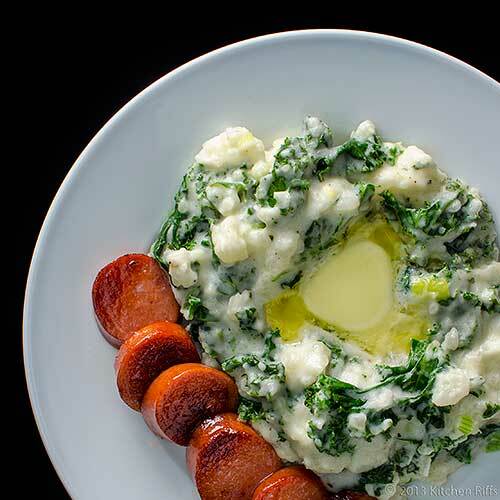 Colcannon is one of those “concept” dishes where exact measurements aren’t that important — you can vary things quite a bit to suit your individual taste. This recipe takes about 10 minutes of prep time, plus another 20 minutes or so cooking time (some of it unattended). So figure 30 to 35 minutes total to make this dish. This recipe yields 6 generous side-dish servings. Leftovers keep a few days in the refrigerator in an airtight container. Scrub the potatoes, peel them, and cut into chunks of 1 to 2 inches square. Make sure the chunks are roughly uniform in size (so they’ll all take the same amount of time to cook). Place potato chunks in a large pot filled with cold water (enough to cover the potatoes), add salt to flavor the water (a teaspoon for every quart), and put the pot on the stovetop. Bring to a boil, reduce to a simmer, and cook until potatoes easily yield when you insert a fork. Cooking time is usually about 20 minutes, but this varies depending on the size of your potato chunks. Meanwhile, wash the kale (don’t dry), stem it (just pull out the stems as you would when you clean spinach), and chop into pieces of an inch or less. Wash the scallions, cut off the root ends, and slice thinly (both whites and greens). If substituting a leek, wash thoroughly, cut off the root end and the dark green leaves, cut into quarters, and slice thinly. About 5 minutes before you judge the potatoes to be done (exact timing isn’t critical), place a large Dutch oven on medium heat (you can substitute a 12-inch skillet with a lid — see Notes). Add 2 tablespoons each of oil and butter. When the butter is melted and hot, add the kale and scallions. Sauté for a minute or two, then turn down the heat a bit and cover the pot with a lid. You want the kale to both sauté and steam in the residual water that clings to it from the cleaning (if there’s not enough water to produce steam, add a couple of tablespoons from the potato pot). I prefer to cook kale no longer than 5 minutes; it’s often still a bit crunchy at that stage — just how I like it. If you like it softer, keep cooking. If the kale is finished before the potatoes are, no worries: Just remove it from the heat and let it rest. While the kale is steaming, the potatoes will probably finish cooking. Take them off the heat, drain them, then add them back to their cooking pot (off heat) and cover. Shake the pot a couple of times so the potatoes don’t stick, and allow them to firm up for 2 to 4 minutes (exact timing isn’t critical). When the potatoes are firm and the kale has cooked, add about half of the milk or cream to the pot containing the kale. Cook for a few seconds, then turn off the heat. Remove the pot from the stove and place on a nonslip heatproof pad on a sturdy work surface (the heatproof pad will protect the work surface; you can ignore this if your counters are heatproof). Add the potatoes to the pot with the kale, and using a potato masher or large spoon, begin mashing. Add more milk or cream if needed, and butter to taste ( I usually end up using a total of about a stick of butter when I make this, plus extra for Step 9). Add salt and pepper to taste. You can mash the potatoes to whatever consistency you prefer, although I think this dish is better with a rough, chunky consistency rather than a “whipped” texture. Empty the mashed potatoes into a bowl. It’s traditional to make a well in the potatoes with the back of a spoon, and add a couple of tablespoons of butter (which will melt from the heat of the potatoes) as a flavoring and garnish. Or you can dish up the potatoes on plates, and then make wells and add the butter. 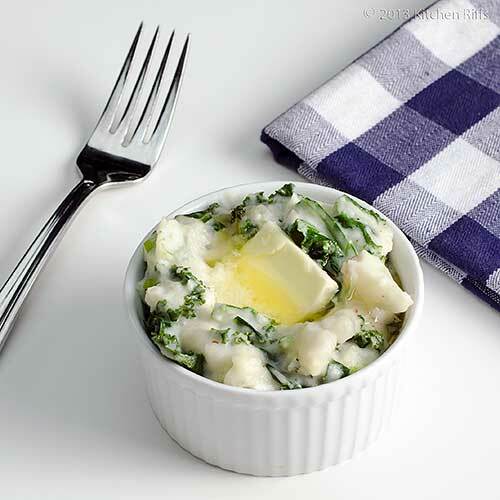 When eating the Colcannon, it’s traditional to dip forkfuls into the melted butter. If you want to substitute cabbage for the kale, I’d use half a head (about a pound and a half). The easiest way to cook it is to cut it up and steam it until tender as discussed in out post on Steamed Vegetables — it’ll take perhaps 10 minutes. Or I’d think you could cut it up and boil it with the potatoes (I haven’t tried this). If you do that, I’d add it when the potatoes are half cooked — overcooked cabbage is quite unpleasant. This recipe uses a lot of butter. You can use less, but I wouldn’t omit making the well and adding butter (Step 9 in the Procedure) — it looks pretty, and is mighty tasty. If you don’t want to use scallions or leeks for this dish, you can use a small onion; or omit altogether. Some people like to garnish this dish with rings cut from the green stems of the scallions. If you make the dish with kale, I don’t think it’s necessary — the kale is plenty attractive. But if you make it with cabbage, the dish looks a little bland and may need a garnish. If you prefer to cook the kale in a skillet, just follow the same general procedure as described in Step 5. But then in Step 8, add the kale to the potatoes, and go from there. The English dish called “Bubble and Squeak” is similar to Colcannon, though it is fried in a pan (it can also be made with potatoes and vegetables leftover from a roast dinner). In the US, Colcannon is eaten mostly around St. Patrick’s Day — because that’s the only time many of us think about Irish dishes. In Ireland, the big occasion for Colcannon is Halloween. There are several traditions surrounding Colcannon. One involves serving it with a ring and thimble hidden inside for people to find (hoping that no one breaks a tooth!). The person who finds the ring is supposed to be the next to marry, while the one who finds the thimble will remain a spinster. Another tradition substitutes coins as prizes; the finder is supposed to experience good fortune the next year. In yet another tradition, an unmarried woman might put some Colcannon in a stocking and hang it outside her front door; the next man to enter through the door would be her future husband. The potato may be the reason that St. Patrick’s Day is so widely celebrated in the US (and in other countries around the world). By the 1820s, potatoes had become a principal food of many Irish people, particularly the poor. So they lost a major source of nutrition when the potato blight hit in the 1840s. The blight actually returned several times during the 19th century, but the worst period was between 1844 and 1850, when it hit every year, resulting in widespread suffering and starvation. No one knows how many people died during the potato famine (many deaths were from disease triggered by malnutrition, and not directly from starvation), but a realistic estimate is 1 million people. Many more emigrated to escape the misery. It’s estimated that somewhere between 1.5 to 2 million people left Ireland for other countries, including England, Scotland, the United States, Canada, and Australia. Although many Irish emigrated before and after the potato famine of the 1840s, the largest population shift by far occurred during that period. By 1850, Irish immigrants made up a quarter of the population in the US cities of Boston, New York, Philadelphia, and Baltimore. In Canada, half the population of Toronto was Irish by 1851. Today in the US, the descendants of those Irish immigrants think of St. Patrick’s Day as a time to wear green, drink Guinness or Irish Coffee, and have some Corned Beef. It’s a ritual many of us enjoy, even those who have no Irish blood. I always look forward to it. And for the record, I do have some Irish ancestry, as does Mrs. Kitchen Riffs. But I’d celebrate even if I didn’t, just to honor those brave people who, facing misery and famine, struck out into the relative unknown to find a new and more prosperous life. Starvation isn’t a problem for most of us these days, but we all sometimes face what seem to be insurmountable challenges. So we can identify: At one time or another, we’re all Irish. And what better way to remember and celebrate than with a dish that features the potato — Colcannon? Oh yum, I have never tasted this but now I have the idea of the butter calling me from the middle of it and... Next time, instead of doing just mashed potatoes I'll have to do it like this. Yum. Hi Alex, this is totally a wonderful dish - great way to eat kale. Thanks for the comment. As someone who's part Irish herself, I love your post! The substitution of kale for cabbage is brilliant, and makes it much likelier that I'd try it. Great post. Gorgeous! Now I know what to cook tonight!!! Thank you so much! I love kale and recently discovered what a rich addition it can be to my cooking. Hi Beth, glad you enjoyed it! The kale is wonderful in this dish - really worth having. Thanks for the comment. Hi La Torontoise, and welcome! I'm glad you're enjoying the blog, and I really appreciate you letting me know. Thanks for your kind words, and comment. Hi Terra, that butter really makes the dish, IMO. And this really could be a meal in itself - it's quite a hearty dish. Thanks for the comment. 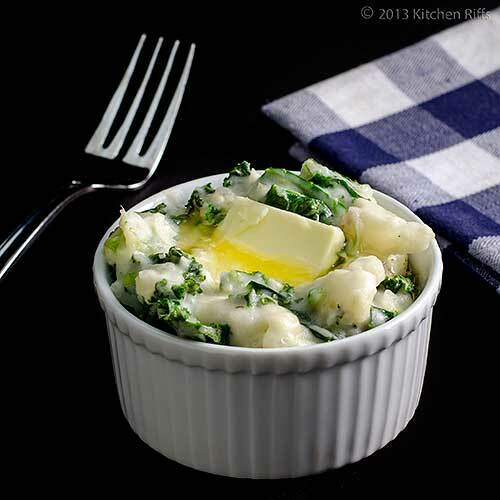 Love the addition of kale and all the butter! Really just glorified mashed potatoes, huh? I always wondered what colcannon was so this explained it! Potatoes are really one of my most favorite foods and new ways to eat them makes me very happy! Thanks! Hi Uru, it's a great dish, and one I think you'd enjoy. ;-) Thanks for the comment. Hi Abbe, it is indeed really just glorified mashed potatoes. All the kale makes them healthy. ;-) Thanks for the comment. The mashed potato and butter part are tempting me. It was interesting to read that kale is a part of the cabbage family. That would explain why it had such a bad effect on me when I tried it for the first time. It is full of fructose. I could substitute spinach which I am fine with. My birthday is on St Patrick's Day so this could be a great dish for then. Oh my gosh this is fabulous. I'm Irish and had no idea this existed. But then I've never really delved to deep into my heritage or it's cuisine. I think I need to change that. I love potatoes way too much. I swear I must eat one or two whole ones raw while prepping any potato dish. It's my weakness. I love colcannon and usually make a large enough pot of it so that I can have it a second night...it is that good. Great photos as always, John. Hi Liz, I'd hope he'd say "thank you!" But if he's not a kale lover, I guess not. The half batch route might be safer. ;-) Thanks for the comment. Hi Suzanne, I think spinach would make a great substitute. In fact I really like the idea - I'll try it sometime myself. ;-) Thanks for the comment. Hi Kim, potatoes are my downfall too! So good, and so easy to overeat. Since you're Irish, you definitely need to get acquainted with this dish! I think you'll love it. Thanks for the comment. Hi Karen, we always make extra, too, so we can have left overs! ;-) Thanks for your kind words, and your comment. [laughing] Wondered why colcannon was becoming such a favourite topic on food blogs in the past few days: Paddy's Day, of course! I have made it off-and-on for decades but always using the cabbage version - well, there is a new recipe to try at such a good time for our autumnal weather :) ! We love potatoes in our house, so the colcannon sounds great to me. Hi Eha, it's kind of predictable that at certain times of the year we'll be writing about certain foods, isn't it? ;-) The cabbage version is good, but IMO the kale is far, far better. But I like kale, and of course not everyone does. Thanks for the comment. Hi Carolyn, I certainly can't resist mashed potatoes, with or without the butter! Although the butter is so enticing, isn't it? Thanks for the comment. Hi Dawn, sounds like this dish would be a hit at dinnertime for you and yours! Thanks for the comment. Hi Charlie, this is probably the time of year to post about Colcannon (and corned beef and Irish soda bread, etc.). This is a pretty hearty dish so I would wait for cooler weather. And sausage with it is so nice. Thanks for the comment. I didn't know that it comes from Irland. I tried it once and was delicious. Thank you for a recipe. Hi Anne, Brussels sprouts sound like a wonderful idea! They're basically almost small cabbages anyway. ;-) Thanks for your comment. Hi Marta, this recipe is so nice, isn't it? Thanks for the comment. Hi Marina, they taste so wonderful when combined! Since you like them both, this dish has your name on it. ;-) Thanks for the comment. I do not believe this! I am far behind in my blogging duties -- and I just paid the price. Tonight's dinner included mashed potatoes and some sautéed kale. Having just returned from a grocery run this morning, my crispers are full. I could easily have made this dish tonight -- and surely enjoyed it! This will teach me to fall behind! This is a great recipe, John, and an interesting post, a really enjoyable read. Thanks for sharing -- and I'll try to keep up. Promise! So comforting and deliciously rustic! A wonderfully tasty dish. Hi John, mashed potatoes and kale are great sitting next to each other on the plate, but really interesting when combined! Sorry you missed the opportunity tonight - but there's always tomorrow! Thanks for the kind words, and comment. Hi Rosa, it really is a great dish, and pretty too. Thanks for the comment. Hi Cathleen, you won't be sorry you tried this! Totally delish. Thanks for the comment. The dish itself looks gorgeous and when you think about the health benefit of Kale, its a super dish. I loved the color combination, white and green. Before reading all the way down to the post, my guess was its a dish with egg white and some greens. Lovely snaps too!!! Never had mashed potatoes this way but it looks creamy and delicious! I like that there is kale in it too, nice recipe! Hi Shibi, this really is pretty, isn't it? And the kale helps cut all that butter! Thanks for the kind words, and the comment. Hi Natalie, isn't it a nice dish? And it's a great way to include more kale in your diet! Thanks for the comment. Of course it calls for lots of butter, it's mashed potatoes, right?! ;) We made colcannon last year for the first time and liked it very much. I agree that kale is the way to go. I especially like the photo with the roasted carrots--YUM! Hi Judy, you're right about mashed potatoes requiring lots of butter! And isn't colcannon wonderful? The kale version is way better than the cabbage one. Thanks for the comment. I had to chuckle at the healthy kale topped with a good dollop of butter - my kind of dish!! Looks delicious as always, John. What a perfect St. Patty's Day recipe! I would have never thought to mix potatoes and kale, it sound so perfect! Hi Kristy, yep, despite the kale, this dish is far from healthy! The kale is awfully good it in, though. Thanks for the comment. Hi Kristi, it really is a nice combo, and so good. Thanks for the comment. Charlie and I quite often visit the same sites: thus we found one particular colcannon within hours of one another! A fun question to you [got it from the same place]: have you ever heard of 'Rumbledethumps' - a rather similar Scottish version? And no, I am not making it up :) ! Hi Eha, I saw a reference to it when I was reading about Colcannon, but I'm not sure exactly how it differs from Colcannon. My impression is that it's more like Bubble and Squeak - it's fried in a pan. But I could be way wrong. I love mashed potatoes, kale, and butter! This is absolutely calling my name. Looks delicious! The butter looks amazing!! I read where you could substitute cabbage. I wonder about using both? Some onion is usually added and sometimes even a little leftover meat and it is then baked in the oven: called kind'of a 'Scottish Colcannon' :) ! Interesting!! Thanks for the info! That really is interesting. Baking it in the oven sounds delish. Hi Judy, interesting idea to use both kale and cabbage - I don't see why you couldn't! Thanks for the comment. I've made this dish before. It's totally hearty, very tasty, and I love that you used kale. Hi Kristi, isn't this a great dish? You're right that's it's hearty, and the kale is wonderful in it - great flavor, better color. Thanks for the comment. I love kale and potatoes but never heard or knew this dish! I am learning a lot about Irish food this week! I've never heard of Colcannon...it looks great! Irish food to me is always hearty...most often a beef stew or pie! And, yes, always with potato! Yes, I often think Ireland would be a fine place to live, especially with all the delicious culinary treats they're famous for like this delicious looking colcannon. YUM! Hi Nami, the blogs are full of Irish food this week, aren't they?! This really is a nice dish - worth trying, IMO. Thanks for your comment. Hi Katherine, you're correct about corned beef - this tradition is very much Irish-American (check out my corned beef post - there's a link above in the "You may also enjoy" section at the end of the post - for more info). Pork would definitely have been the meat of choice in Ireland. Ham, sausage, or bacon (I think Irish bacon is different from that which we have in the US, but I'm not sure on that) would have been the popular choices. But it's also good with corned beef, and that's what most people in the US probably would be eating. Thanks for the comment. Hi Ali, it's a great dish! And definitely is hearty. Really, almost a meal in itself. Thanks for the comment. Hi Chris, I've never been to Ireland, but I understand the countryside is just lovely. And of course there's great food. ;-) Thanks for the comment. Great post John and your colcannon looks fantastic. Hi Nazneen, with kale and potatoes in your kitchen you have no excuse not to make this! And you're right that Colcannon and Bubble & Squeak are extremely similar. Thanks for your comment. A butter garnish? Bravo, sir ... bravo! I adore colcannon ... it defines comfort food. Lovely post! Hi Kimberly, I think butter is the ultimate garnish. ;-) This is such a great dish, and you're so right that it defines comfort food. Thanks for the comment. Happy St Pattys day to you. Your colcannon is beautiful. I have never had this dish but I think my teenagers might even like it if I garnish it with a tad of butter. What a treat for St.Patricks Day! I love potatoes and this looks like an extra tasty dish. The picture is amazing,thanks for sharing. Hi Bam, Happy St. Pat's to you! Isn't this a wonderful looking dish? I'll bet your teenagers would indeed like the mashed potato part (maybe not so much the kale). Thanks for the comment. Hi Daniela, isn't this nice? And it really is a pretty dish. Thanks for the kind words, and the comment. Oh John, I am so embarrassed, I never heard of Colcannon...I love the idea of some green in the potato...and I absolutely love the butter melting in it...looks delicious and very hearty indeed. Hi Juliana, this is a wonderful dish! I agree the green looks so nice in it. Happy St. Pat's Day to you, and thanks for the comment. Is it really bad if the first thing that come into my mind when thinking of Irish food is Irish coffee? Yes, I know it's a drink but still, that the first thing I think about! Having said that, this is such a comforting dish! Hi John, something new to me but it sure look very appetizing. The combination of the ingredients look great to me. Thanks for sharing the notes. I really admire your photography skill, you're excellent! Hi Gourmantine, lol! I'm actually surprised that isn't the first thing that comes to mind for me! Thanks for the comment. Hi Amelia, isn't this a nice dish? Really a great combination of flavors - extremely satisfying. Thanks for your kind words, and comment. That looks creamy and buttery, yum! Hi Raymund, this really is delish - I think you'd like it. Thanks for the comment. I like kale way better than cabbage, so I love you subs. So glad you didn't skimp when it came time to put a huge dollop of butter on top, lol. I wish I had some kale in the fridge I try this tonight. I will be to the store soon enough, so hopefully I can try this before St. Patrick's Day. I'm not Irish, but I always try and show some support. Hope you and the Mrs. are having a great week. You know I love colcannon...I've seen it recommended with kale but I went the more traditional route but still I wonder why I always wait and only do this once a year? That needs to change! Hi Gina, I think you'll be quite happy with this dish - great flavors. Of course, with butter, how can it not be good? ;-) Thanks for the comment. Hi Barb, yeah, I do know you like colcannon - yours looked great! The kale is really a nice change - worth trying, IMO (in fact I think it's better than cabbage in this dish). I, too, wonder why I don't make this more often - it's so good! Thanks for the comment. This is stunning, John! Your photos are incredibly tempting. I've made colcannon before with cabbage and never thought to include kale. I'll be making a batch quite soon and I'm sure my family will be thanking you. I enjoyed your notes, too - I wonder if colcannon is ever hung on the door in a stocking anymore? Hi Hannah, cabbage is good in this dish, but kale is wonderful! And it really looks better, at least IMO. Good question regarding whether anyone ever hands their colcannon in a stocking - I can see people still doing it more for fun than anything else! Thanks for the comment. Yum John - I love colcannon, I'm a greens and potatoes fanatic. Lol, definitely indulgent with the butter but for a special treat it's worth it. Thanks for giving all the info on traditions around the dish, it's so interesting. Hi Food Jaunts, the amount of butter you can cram into this dish is kind of outrageous, isn't it? ;-) This is a fun dish - glad to hear it's one you enjoy, too. Thanks for the comment. Hi C.J., isn't this a great dish? Really a great way to eat kale. And butter. ;-) Thanks for the comment. Hi Carole, thanks for the info - I'll check it out.